The CBX family of automatic intelligent battery chargers are designed for industrial-automotive applications in harsh environments. Utilizing high performance components and corrosion-resistant anodized aluminium housing, it allows you to build a reliable control panel for standby generators. 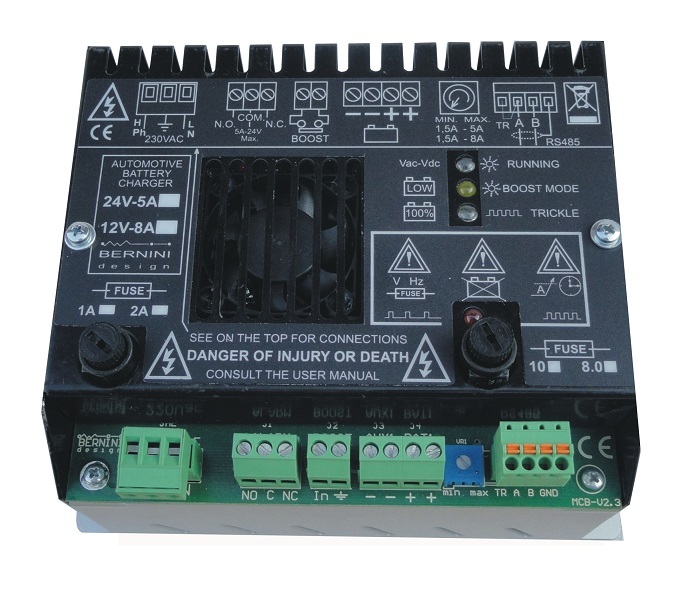 The MCB is a microcontroller based, intelligent battery charger, ideal for standby generator control panels. The LX family of automatic intelligent battery chargers are designed for industrial-automotive applications in harsh environments. Utilizing high performance components and corrosion-resistant anodized aluminium housing, it allows you to build a reliable control panel for standby generators. The LX is a microcontroller based, intelligent battery charger, ideal for standby generator control panels. - Boost Mode pushbutton, Current setting via Trimpot. The CB-2.0 automatic battery chargers is designed for industrial-automotive applications in harsh environments.Using a high performance components and corrosion-resistant materials, it allows you to build a reliable control panel for standby generators. The model CB2-12V-2A is a cost effective solution for simple and small to medium size AMF Panels. The CB2 is 'Current limited' and outputs the rated current only. The IN-CORE family of automatic battery chargers are designed for industrial-automotive applications in harsh environments. It provides automatic Boost and Trickle charge. The design of this battery chargers include an 8-bit micro controller to provide intelligent charging. Thanks to the super-switch high frequency solution, you can manufacture light-weight portable control panels. These battery chargers are able to operate in a wide range of temperature. This Charger is the ideal choice for vented LEAD-ACID batteries; other models are available on request. There are two basic versions: IC12-8A and IC24-4A Volts.